ISBN: 9780861592029 | Published by: British Museum Press | Series: British Museum Research Publication | Volume: 202 | Year of Publication: 2017 | Language: English	202p, H297 x W210 (mm) 80 colour illus. For more than 300 years commercial fishermen working in the outer Thames estuary have recovered Roman pottery in their oyster dredgers and fishing nets from the seabed in the vicinity of Pudding Pan. However, despite numerous attempts to locate the source of the material, this elusive site has remained undiscovered beneath the waves. This book assesses the recovered assemblage from Pudding Pan to determine the nature and location of the site. Almost 700 artefacts have been retrieved from this area to date, the majority of which are complete plain samian wares, one of the key indicators of the widespread cultural reception of Rome, which were undoubtedly transported throughout the Empire in huge quantities. 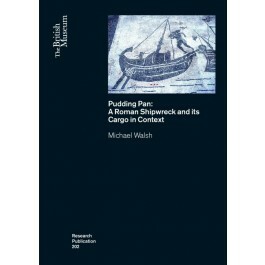 The exhaustive research presented in this book convincingly argues that the material represents an unknown proportion of a cargo from a Roman trading ship en route from northern France to London that was deposited on the seabed between AD 175 and 195; it is not yet clear whether the deposit represents a shipwreck or a jettisoned cargo. Such a site is extremely rare throughout the Roman Empire, particularly so in northern Europe, and its discovery could play a crucial role in our understanding of Roman trade. The search for the site continues, but this publication offers the first detailed study of a seemingly predominantly samian cargo in British waters and contributes a new perspective on the organisation of trade and consumption in the Roman era. "This book is essential reading for researchers of Roman trade and Samian pottery. At last, the Pudding Pan Samian ware has the report it deserves."